Cody Friedland self-identifies as a half-White, half-Filipino Republican millennial. He has always gravitated toward the Republican Party. He’s a staunch supporter of Republican presidential candidate Donald Trump, and believes Trump’s hardline immigration policy proposals are sound, even though Friedland’s mother is an immigrant from the Philippines. Friedland, 21, a criminal justice major at Arizona State University, recognizes that his conservative political values clash with most in his millennial generation, who tend to lean toward the Democratic Party. But he’s not afraid to have counterintuitive political views. “Honestly, I might be minority, but I don’t see it that way … This is what I genuinely believe in,” Friedland said. “I’m not really trying to follow leader,” he said. Like other active members of ASU’s College Republicans, Friedland understands the significance of recruiting minorities, like Latinos, to the party ranks. But the group has chosen not to focus on ethnicity to recruit politically active millennial students, he said. As the nation’s demographics shift, voters are more diverse than ever. Latinos and African-Americans are expected to make up about 24 percent of eligible voters, according to Pew Research Center. According to Pew, the uptick in diverse voters comes in part from the growth of Hispanic eligible voters. Kevin Cota, 28, who self-identifies as a “mutt” with several ethnicities, including Hispanic, said he once leaned Democrat. He became a Republican during the 2012 election, he said, because he realized his values and philosophical views better align with the Republican party. Cody is not worried that Trump’s performance in the first debate with Democratic presidential candidate Hillary Clinton will negatively impact the election.“I mean Trump will be Trump, that’s his personality and that’s not my problem with him,” Cota said. 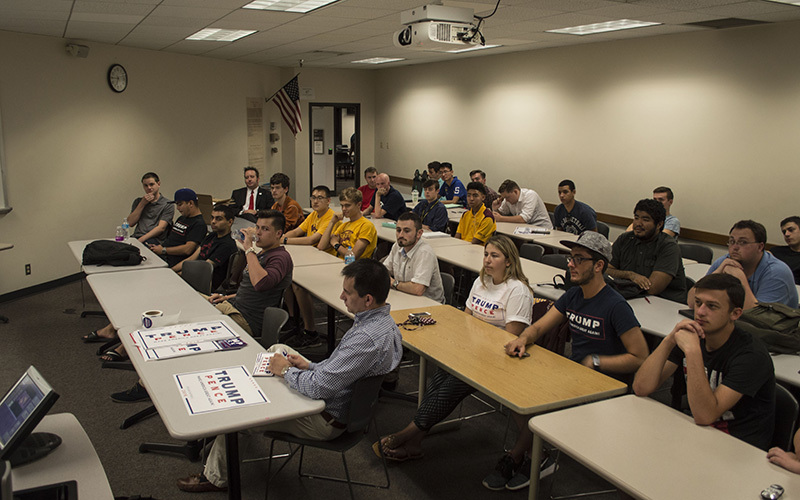 The ASU Republicans, which have about 80 members, meet weekly to discuss politics and strategize. They recruit students to become Republican voters through social media, from tables set up on campus, and by canvassing neighborhoods, said Kevin Calabrese, the club’s president. The group has worked alongside the university’s undergraduate student government to recruit students to vote, Calabrese said. So far, the two organizations have registered a total of about 200 students, he said. ASU has more than 70,000 full-immersion students. “For any political party to prosper into the future, they must take into account this growing flock of voters, take into account issues important to millennials and Hispanics and take into account growing demographics,” Calabrese said. “But we are standing behind the policies that Trump has proposed,” he added. Calabrese said the club has seen a “noticeable increase” in Hispanic members as well as many other minority groups. Even international students are welcome, he said, because they can convince other students to vote Republican. As the election nears, said Calabrese, ASU Republicans have joined phone banks on “Trump Tuesdays” at the Arizona Republican Party headquarters in Phoenix. Calabrese said Hispanics and other minorities are joining the organization because they want someone with new and ambitious ideas to lead our nation: Trump. “Not everybody is going to like every one of his policies, he has policies I don’t like as well, but the big picture is that he has a lot to offer that Clinton does not have to offer,” Calabrese said. People who enter the country legally, like his mother, deserve respect, he said. To Friedland, the presence of undocumented immigrants disrespects the struggle of legal immigrants. “I know Trump’s policies and I can sleep at night knowing that I am not being a traitor to my heritage or race,” Friedland said.